Today I’m catching up on some highlights from my summer road trip through France and Spain. And since it seems I’ve been talking a lot about chilled summer soup revelations lately, here is a story about such a revelation from mountain high! I was nearing the end of my summer road trip through France and Spain. I had just bid my travel buddies farewell at the airport in Bilbao and had four nights before I needed to catch my Brittany Ferry in Santander and reluctantly head back to Britain and life as usual. I had already set my sights on the Picos de Europa, part of the Cantabrian mountains, about 20 km inland and conveniently just a couple hours drive from the Santander ferry port. The mountains called to me, not only for its proximity to my exit point, but for its impressive massifs magically packed together in a relatively small space. 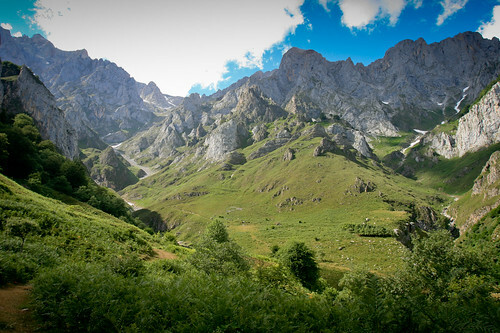 People rave about the wonder and awe of the Picos. And I liked the idea of hiding away in the mountains for a few days before having to face the real world again. I chose as my base Posada de Tollo, a mountain house about 10 minutes’ drive from Potes, the main market town in the Picos. I chose it for being unabashedly dog friendly and for reviews that its food was “scrummy”. But the place had a lot more going for it than that. My first impressions were of the clean and modern entry room with Pink Floyd and Led Zeppelin posters on the walls, Leonard Cohen playing on the radio, and Berta. Berta had a nose ring and wore black from head to toe except for a few dramatic grey streaks in her long hair and a pair of ginormous slippers, designed in the style of ogre feet (with painted toenails and all!). After checking in I said I’d like to have dinner at the posada in the evening, and Berta got all excited because this was the first year she was cooking with vegetables she’d grown in her garden. She also seemed to like the challenge of cooking for a vegetarian. 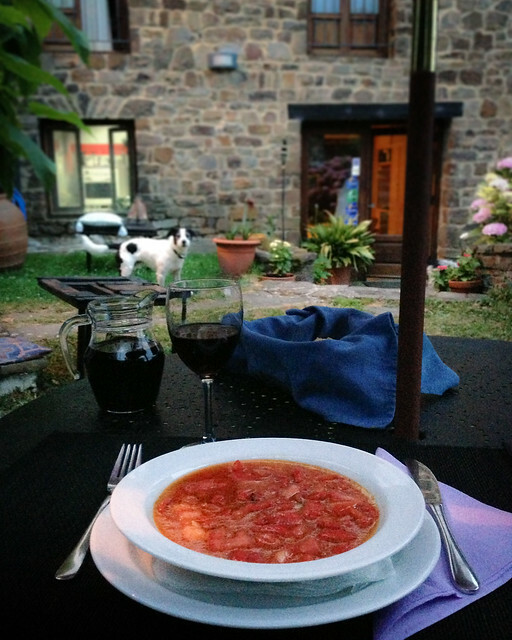 Berta explained that the dish was a “soup” traditional to Extremadura, a community in western Spain where her family is from. 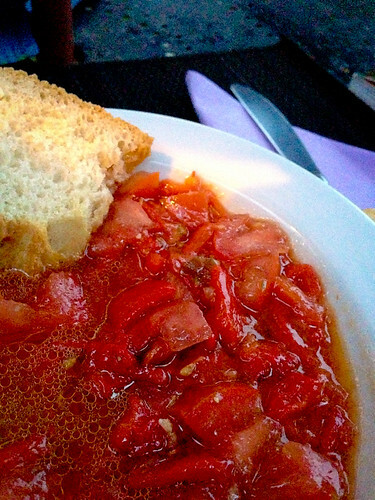 The soup is made with roasted red peppers, fresh tomatoes and – what was that spice I tasted? Berta called it “comino”, and because my Spanish is pathetic, I had to use powers of deduction to realise it was cumin! Not toasted, she said, just ground to a paste with garlic and salt, then mixed in with the tomato and red pepper and a generous amount of “good” (Berta stressed this word!) olive oil. The dish is called “Moje de Pimientos Asados Con Tomate y Comino”, which translates to “Roasted Red Pepper Dip with Tomato and Cumin”. And being a “dip”, you’re meant to sop up the “soup” with lots of bread. This vegetarian soup was as magical as the Picos. Of course, part of the thrill was having a home cooked meal made by a recipe that had been passed down through the generations as it were. But also, it was just really really good. Pure, simple, seasonal ingredients: a true case of the sum being more than the parts! And the cumin – a real dash of genius, giving the soup just a little hint of smoky earthiness. And the final lesson: life is too short for lesser quality olive oil. 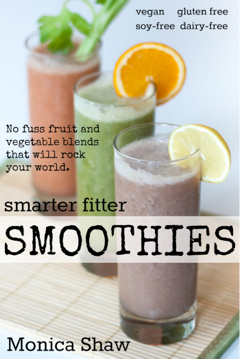 Use the good stuff, and use it generously! Also known as [i]Moje de Pimientos Asados Con Tomate y Comino[/i]. Roast the peppers in the oven or over an open flame until black all over. Remove into a sealed container. Once cool, peel the peppers, de-stem and de-seed them, then slice into strips. In a mortar and pestle, pound together the garlic, cumin and a good pinch of salt until it forms a paste. Dice the tomatoes into big chunks (you can peel them if you’d like by blanching them in boiling water). Combine everything together with a good glug of quality olive oil. Let sit for an hour or so to let the flavours marinade. If it’s not “soupy” enough for your taste, add a bit of water (and more olive oil if you’d like) to the desired consistency. Serve cold or at room temperature with bread. I went to Spain with Brittany Ferries (0871 244 1400; www.brittany-ferries.co.uk), which has sailings from Portsmouth to Santander. It’s about a two hour drive from the Santander ferry port to Potes, the main market town in the Picos de Europa. 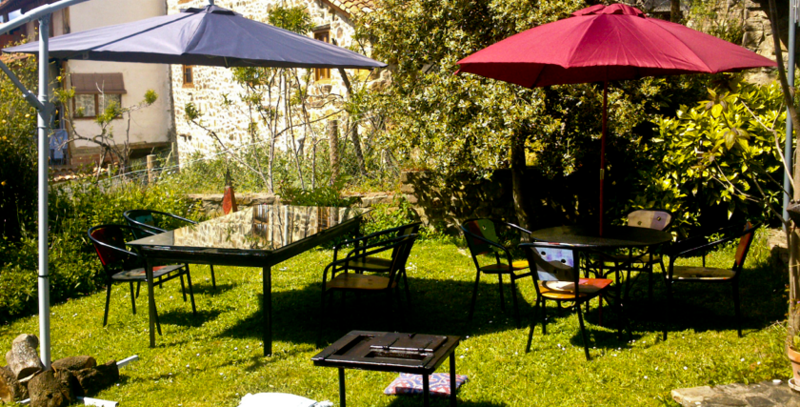 I stayed at Posada de Tollo (Mayor, 13, 39575 Tollo, Spain; www.posadadetollo.es), about 10 minutes’ drive from Potes. 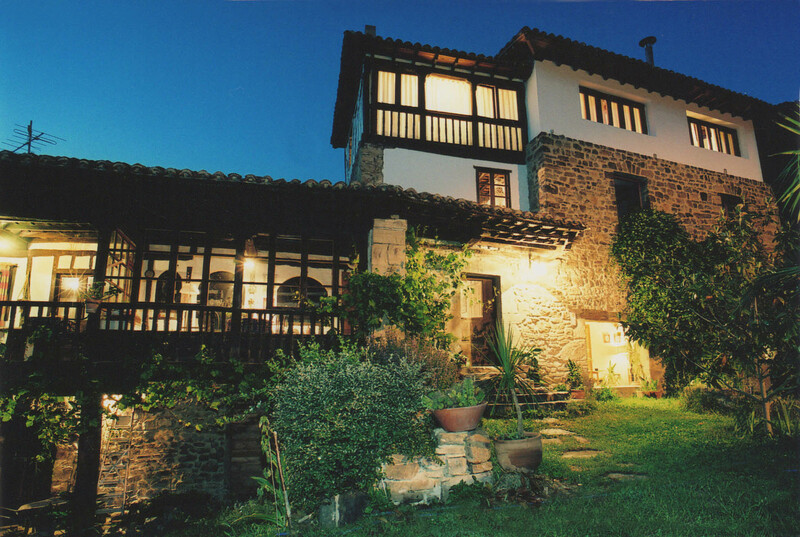 It’s a mountain house with friendly owners, friendly dogs, home-cooked meals and incredible views of mountain summits and villages. Quality olive oil (from Spain) does make the world go round. 🙂 That soup looks ridiculous too–so simple, so many of my favorite flavors all in one. I love it. I’m missing Spain now!